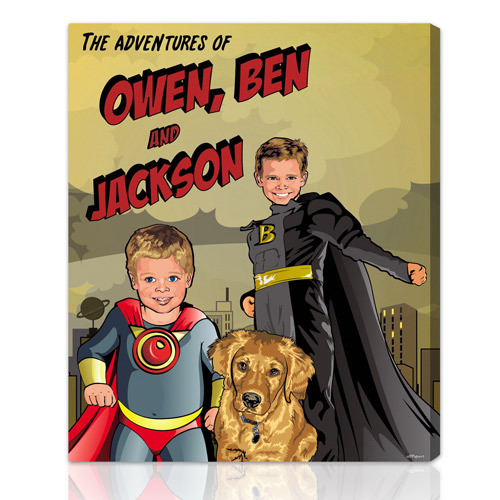 Personalized comic book superhero pictures. Just select your favorite character, background, text and send us a head shot of your hero to be. 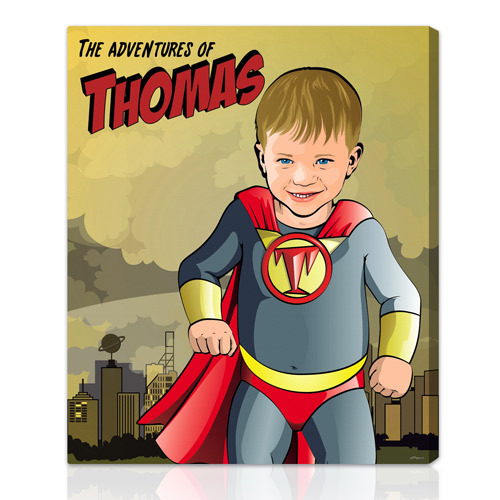 Inspired by our favorite comic book characters, we create super hero pictures that can be personalized from your photos to fit any style and décor. You just send us a head shot photograph and we'll illustrate the face on the body of a super hero. You can choose from different backgrounds and also personalize the artwork with your own text. Expertly crafted by the illustrators at All Pop Art. As seen in Oprah, Vanity Fair and Metropolitan Home. 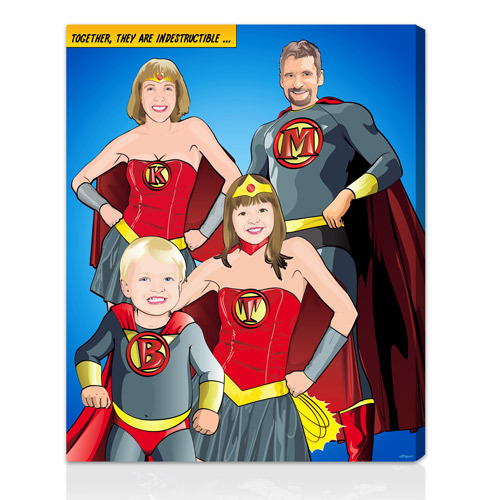 GUARANTEED PREMIUM QUALITY: Your superhero picture is expertly crafted and lifetime-guaranteed to last. All the hanging hardware is included with your portrait, so your gift will arrive ready to hang and to impress for life. OUR MATERIALS: The canvas of our pictures is the highest quality available in the US, museum-grade, 100% cotton canvas with a satin finish and invisible UV proof filters. Its waterfastness eliminates the need for spray or harmful varnish overcoats. Its double-weave allows for better framing without edge cracking. Our archival fine art luster paper offers high definition, brilliant color and saturation. All our materials are 100% acid free for archivability and water resistant. OUR INKS: We only use HP Vivera® Inks that feature superior ingredients that are pure, and free of harmful contaminants, ensuring optimal reliability and performance. 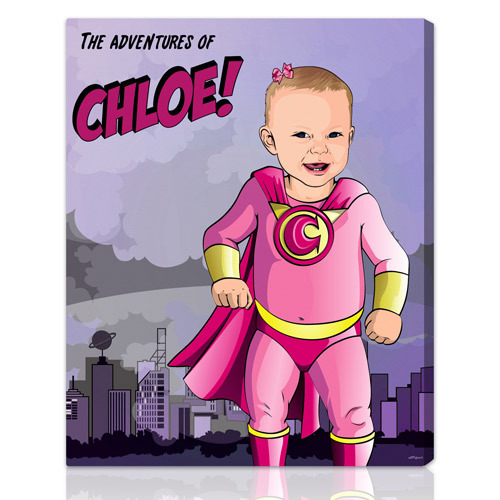 SUSTAINABLE GIFTS: We design, print and frame our eco-friendly professional-finish superhero pictures and gifts fully in our premises while complying with sustainable production guidelines. FAMILY FRIENDLY: Keeping in mind that most of our pictures are gifts for kids and babies rooms, we guarantee they are 100% free of harmful materials. FAST DELIVERY: Total turnaround time 2-7 days. Free US shipping. Worldwide delivery available. RUSH orders available. OUR GUARANTEE: If you don't absolutely love your portrait or gift when you receive it, simply send it back to us within seven days from the time you receive it, in its original packaging, and we will either redo it a no additional charge (using the same design) or refund your money back. No questions asked. It is that simple. We have been in business since 2004 selling our art to tens of thousands of customers and we have a return rate for faulty products of less than 0.1%. WE CARE: Your satisfaction is the key to our success, we take care of everything so you don´t have to. Any questions? Feel free to contact us anytime at our toll free number 1.877.728.9278. Place your order online or by phone toll free 1-877-728-9278. Upload your photos after the order is placed, or send them via Email or Mail (we’ll return them). Your custom art will be delivered one week after your approval. Rush options available during checkout for additional fees. FREE Ground shipping in the US - AllPopArt is happy to be able to offer free FedEx ground shipping for every order to be delivered within the continental US. Additionally, we offer two other methods to rush your order for expedited delivery during the checout process. FAST PRODUCTION PROCESS! - From the day we receive your photo and it is approved to be put in process it'll take approximately 1-2 business days to complete and ship the entire order. Once your order ships out you will receive an email with your package tracking number. PROFESSIONAL PACKAGING - Each one of our portraits is delivered in perfect condition. Our professionally trained production team packs each portrait carefully to ensure safe arrival: Each portrait is wrapped with a layer of shrink-wrap that protects the surface, and then it is wrapped with a thick layer of heavy duty bubble wrap. We firmly secure your portrait in a sturdy, double layered, corrugated cardboard box to guarantee a safe arrival to its new home. Our packages travel all over the world and our team of experts will make sure that your portrait is as secured as can be. SURPRISE THEM WITH THE MOST UNIQUE GIFT - Our portraits make wonderful surprise gifts and are always received with a great response. You can select the recipient's delivery address when placing your order and even ask us to include a personalized note with the package. INTERNATIONAL SHIPPING - We welcome international orders from almost anywhere in the world, including APO addresses! Most international orders are shipped via the US Post Office Priority Mail unless specifically requested otherwise. Delivery date and transit time may vary according to the country’s customs policy, therefore we cannot guarantee delivery times for international shipments unless shipped with FedEx for an additional fee. Please note that all shipments are fully insured and we will ship a new package/portrait in the event of a loss or damage during shipment. If you are not 100% happy with the final portrait you receive, just send it back to us within 14 days from the time you receive it, in its original packaging, and we will either redo it at no additional charge (using the same design) or refund your money back. No questions asked. It is that simple. AllPopArt is a collective of award-winning American artists based out of our Hollywood, Florida studio. Our artists carefully handcraft high-quality digital and mixed media illustrations using your photos for inspiration. Each portrait is a unique work of art. Absolutely no artificial filters or automated software are used. All of our artists are graduates of art and design schools such as the Savannah College of Art and Design and the Art Institutes. Sam was born and raised in New Hampshire and ever since he can remember he was intrigued by art. He moved to South Florida immediately after graduating high school to pursue an education in fine arts. Sam graduated from The Art Institute of Fort Lauderdale in 2010 with a bachelors degree in illustration, and joined the AllPopArt art team shortly afterwards. He won numerous awards at The Art Institute and the New Hampshire Institute of Art. Andreina has been part of our team since 2004 and helped develop many of our art popular styles over the years. She had won numerous awards and specialized in modern digital illustration. Lola has been creating art from a young age and enjoyed art classes in various styles. She resides in the U.S. and in Madrid, Spain and uses her love for travel as a great source of inspiration for her decorative pieces. Eddie grew up with a love for cartoons, comics, and other animation. This has transitioned into an affinity for fine art. He was a part of the Art Honor Society in high school and studied visual arts. In college he earned a degree in Computer Graphics and Design, learning everything from photo retouching to digital illustration. Eddie joined the AllPopArt art team in 2009, and is constantly discovering new retouching and illustration techniques. Tommy was born in Southern California and moved to South Florida in 1994. He has always been fascinated with all facets of art & design, from architecture to graphics, and currently continues his studies in the architecture field. Tommy's a keen eye for color compositions and great photo retouching skills come across in his beautiful creations. Mariella was born in Lima, Peru, where she took many art classes from a young age and earned a Graphic Design for Advertising degree. Upon her arrival to Miami, FL she continued studying towards a fine art degree. Mariella's love for art is reflected in the beautiful diverse pieces she creates everyday. Leah was born and raised in Iowa and moved to Florida to pursue her lifelong dream of being a professional illustrator. She graduated with a bachelors in Illustration and has since been working on various projects. In 2012 She started work at AllPopArt and fell in love with the job immediately. She is a fan of cute, colorful, and mixed media art though has a never dying love of classical paintings. David grew up in Barnegat, NJ and always had a passion for arts, crafts and anything creative. He completed his graphic design and art studies at Rutgers University and Burlington College in NJ, and later on also attended the Art Institute of Philadelphia. David Moved to Florida in 2001 upon completion of his studies and continued creating art. He Joined the AllPopArt team in 2009. His love for contemporary art and pop-culture is reflected in his fun, colorful pieces of art. Lital was born and raised in Tel-Aviv, Israel, where she earned a degree in Graphic design. She moved to South Florida in 2004 and joined AllPopArt studio which became her second home. Her work has been recognized nationally and internationally in design publications and art exhibitions. Lital is very active in the local design community and has won numerous awards. Yaritza was born and raised in Miami, FL and ever since 4th grade up until 10th grade she was in the magnet art program for visual arts, including New World School of the Arts. Yaritza graduated from the Miami International University in 2011 with a bachelors degree in visual and entertainment arts, and joined the AllPopArt art team soon after. 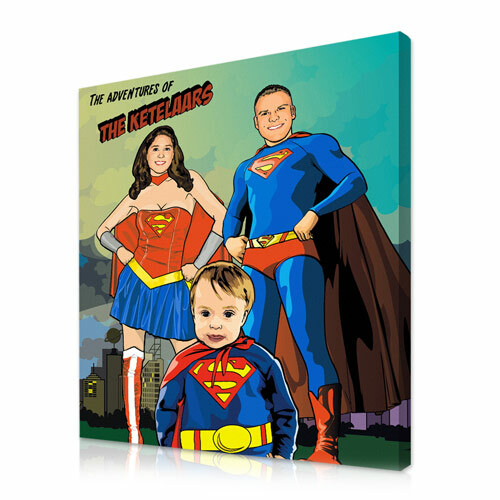 The canvas of our personalized prints is the highest quality available in the US, museum-grade, 100% cotton, with a satin finish and invisible UV proof filters. Its waterfastness eliminates the need for sprays or harmful varnish overcoats. Its double weave allows for better framing without edge cracking. Our archival fine art luster paper offers high definition, brilliant color and saturation. To ensure archivability, all of our materials are water resistant and 100% acid free. We only use HP Vivera® Inks which are made of superior ingredients that are pure and free of harmful contaminants, ensuring optimal reliability and performance. All of the hanging hardware is included with your portrait so your gift will arrive ready to hang and to impress for life. 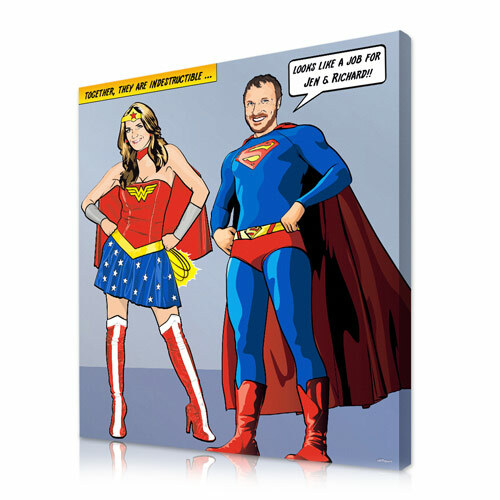 Several magazines, newspapers and TV shows have featured allpopart and our unique personalized gifts and custom portraits and they have considered us repeatedly as the most original and chic idea for wall decoration and personalized artwork. allPopart thanks all of them for their kind words, love and enthusiasm. O! - The Oprah Magazine chose our warhol style personalized portraits as one of their favorite gifts for the Holidays- The O List. We were thrilled, as we were told by the editors that Oprah herself handpicks each one of the gifts that are chosen for the magazine! HGTV's Candice olson selected her favorite pup art from AllPopArt.com to be featured on NBC's Morning Show - The Today Show. Candice, along with Kathie Lee and Hoda, show great ways to decorate any space with personalized pet artwork on a budget, custom created from your photos. 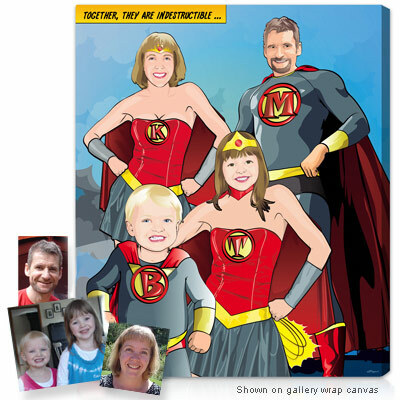 The All Pop Art team lends a hand to the Extreme Makeover-Home Edition team with the home renovations of deserving families around the u.s. We helped make their new home feel warm and welcoming with dozens of personalized family portraits and photos to canvas panels. Our team has been working around the clock along with ABC's Extreme Makeover-Home Edition staff. The hit TV show takes a behind the scenes look at the making of our unique pop art portraits and personalized unique gifts. HGTV - I Want That! Vanity Fair lists our personalized silhouettes as one of the hottest gifts for the Holiday season. And starting at only $50 it is a unique personalized gift that won't break the bank. Metropolitan Home's Holiday Gift Guide featured one of our baby warhol portraits as one of their favorite holiday gifts. As Andy Warhol would say, get your own "Fifteen minutes of frame." How cool is that! House Beautiful loves our exclusive line of silhouettes 2Go as one of their favorite ready to hang art pieces. Our Silhouettes 2Go, ready-made dog silhouettes, are one of the last minute gifts favorites at the Today Show. Elle Decor selects our personalized silhouettes as one of their most sensational summer hostess gifts. Our dog silhouettes win the heart of new dog owner Kate Townsend, market editor of Domino magazine. AllPopArt offers free FedEx ground shipping if your order is to be delivered within the continental US. For Alaska, Hawaii & Puerto Rico you will only pay a discounted shipping fee. We will inform your of these fees once we receive your order. Free Delivery Date is approximate. Let us know if you need it by a specific date. We always do our best to deliver your order as soon as possible. You also have the option to expedite your order during checkout. AllPopArt also ships Internationally. Expedited: Your order will be delivered within 5 business days or less, from start to finish. Rush shipping: Your order will be delivered within 1-2 business days from start to finish. The rates for each option, along with the exact delivery date, will be displayed in your cart during checkout. We try to accommodate reasonable requested delivery dates, at no additional charge. Please mention your requested date in your comments and we will be in touch with you after we receive your order. Remember: AllPopArt also ships Internationally. When do I upload/send my photo? By Mail: No digital image? No problem! Just mail in your photo(s) to the address below and we'll take care of it. Once your photo is received, it will be reviewed to ensure that our artist can use it to create your design based on what you are looking for. You will be notified by phone or email once everything is in process. Need help customizing your order? Chat with one of our art consultants! Our customer service is second to none! 2019 Hotgoldfish Corp. All rights reserved.